Home»China-like Tableware»Masterpiece Collection - Gold and Silver»Silver Masterpiece LOOKS LIKE CHINA!! Silver Masterpiece LOOKS LIKE CHINA!! Masterpiece plates have such a genuine china look that even while fully aware that they are heavy weight plastic, you will still cringe if one falls to the floor. In addition to the 10 inch, 7 inch and 6 inch plates, Masterpiece plates also come with a matching coffee mug so everyone can get their caffeine fix and still stay stylish. 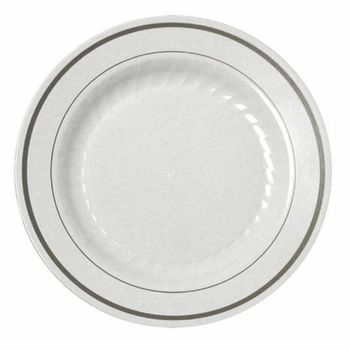 10" Masterpiece Silver Border Plastic Dinner Plate 12ct. 9" Masterpiece Silver Border Plastic Luncheon Plate 12ct. 7" Masterpiece Silver Border Plastic Salad Plates 15ct. 6" Masterpiece Silver Border Plastic Dessert / Cake Plates 15ct. 10oz. Masterpiece Silver Border Plastic Bowl 15ct. Silver Masterpiece 8 oz. Plastic Cofee Mug 8ct. 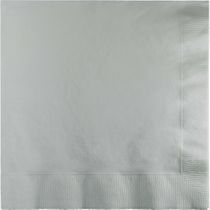 Silver Lunch Paper Napkins 50ct.